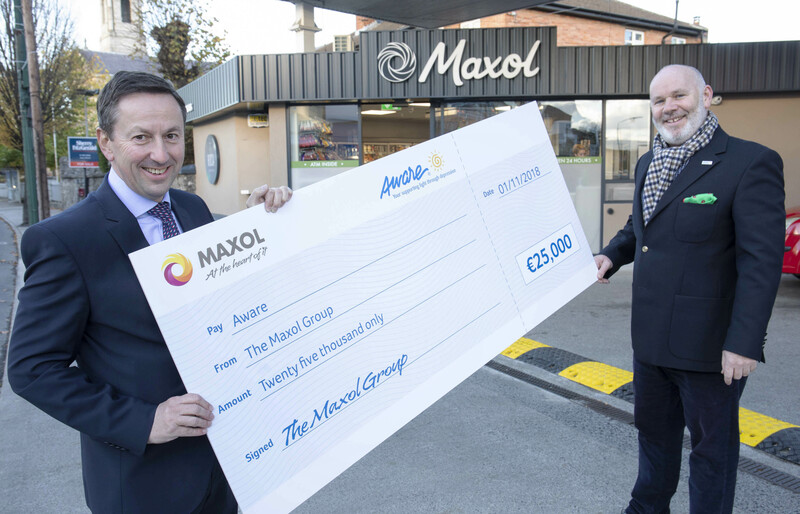 Maxol, Ireland’s leading family owned forecourt and convenience retailer is pleased to announce that the company and its customers have raised €25,000 for charity partner Aware, which provides support, education, and information for people impacted by depression, bipolar disorder and mood related conditions. Maxol supported the charity by donating €10,000 and asking customers to top up their purchase in-store by adding 10cent during the month of August. We are extremely proud of our partnership with Aware and the great work they do across the country. Mental health is such an important issue in Irish communities and Aware listens to the people that need it the most. I want to thank our loyal customers who supported this initiative and helped to raise so much for such a worthy cause”. The Maxol network provides a great opportunity for people in every community in Ireland to find out about Aware. The money raised will go towards providing education programmes to those in need and we greatly appreciate the hard work that the Maxol staff do and of course I would like to thank every customer who donated to the charity also”.